At the Curbside Cafe, the longtime local favorite on California just west of Fillmore, Olivier Perrier greets regulars with kisses on both cheeks and recites the daily specials in his inimitable French accent. He’s the only server in the room and seems to be everywhere at once, yet everyone receives his personal and focused attention. He knows many diners by name, but he also settles newcomers into the small tables with ease. Perrier’s touch is evident in everything from the “bon appétit” on the chalkboard to the bottles of French wine on the tables. He wasn’t always at home here. Having worked at restaurants in the England and Australia, he thought California would be just a six-month stop. Yet now, after five years as a waiter and manager at the Curbside Cafe, he and his wife – who met at the restaurant – are its new owners. 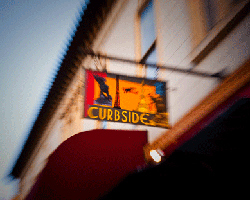 The Curbside Cafe has been a cozy neighborhood spot for more than 20 years, and the location at 2417 California has housed a restaurant since the 1906 earthquake. Regulars return often, lingering over comforting pot roast and homemade chocolate mousse. Diners share glasses of champagne at the outdoor tables on California Street, pass Sunday mornings over omelettes at brunch, drop in for lunch with co-workers and return for intimate candlelit dinners. Taking a leap of faith, Olivier and Gwyneth decided to take over the restaurant, even though they acknowledge it’s a risky time and a risky business. 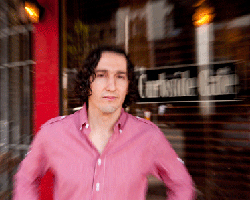 “It’s always a big step to take on a restaurant, but I’ve been in the industry for so long,” Olivier says. “In life you don’t get so many chances like this one. Besides, we consider Curbside Cafe our good luck charm,” says Gwyneth. “Olivier will be perfect,” says former owner Alliaume. “He’s been doing a good job managing, and he’s a good fit for the place. I think if anything he’ll make it better.” Now that the restaurant is theirs, the couple is excited to add some personal touches. Regulars have convinced them not to tinker with the menu too much, but some changes are afoot. They are now working with Golden Gate Meat Company, which uses high quality, mostly free-range meat. They hope that will broaden the appeal of the Curbside’s popular comfort food classics such as chicken piccata and pot roast. Ice cream and sorbet will come from a small supplier in Fairfax that makes batches daily. All other desserts, including bread pudding and chocolate mousse, are made in-house. And the Perriers also hope to reach out to San Franciscans interested in speaking French. 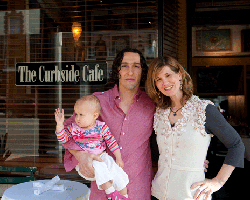 They say they’re committed to making Curbside Cafe their longterm home. And they already feel welcome. When Chloe was born 14 months ago, Gwyneth recalls that Olivier would come home with presents from regulars every night. And they both appreciate the international air and love of food the city champions. With their new additions to the restaurant, they’re hoping even more people will turn the corner from Fillmore to find them. Article taken from The New Fillmore by Anne Paprocki. Photograph by Daniel Bahmani.